Deluxe Controller Stand Our control panel stands offer an authentic arcade experience without the use of a space consuming cabinet. Ideal for the arcade enthusist using a stand alone monitor or wall-mounted television for a display. The cabinet kit contains professionally milled panels that are pre-drilled and ready to be assembled. All assembling hardware is included. No power equipment required. 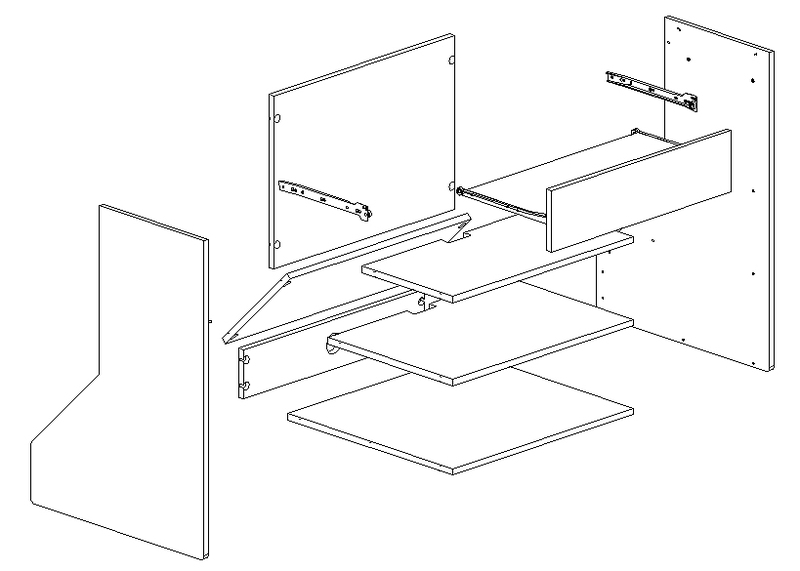 Deluxe Controller Stand The cabinet kit contains professionally milled panels that are pre-drilled and ready to be assembled. All assembling hardware is included. No power equipment required. The Ultimate Bartop 1 cabinet kit assembles in a matter of hours and will put you one step closer to the Ultimate Gaming Experience! The Deluxe Controller Stand kit comes with CNC precision cut black melamine panels and all the necessary assembly hardware. Our kits use a revolutionary post and cam fastening system that allows not only for a fast assembly, but also disassembly. Our kits can be assembled and unassembled over and over while still maintaining structural integrity. Side panels contain a pre-cut groove for installing t-molding, a decorative and protective plastic edging (Sold seperately). ♦ Cabinet width: 25 1/2"
♦ Cabinet depth: 22 15/16"
♦ Cabinet Height: 31 7/8"